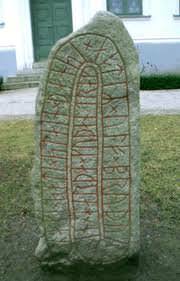 the earliest surviving examples, so it might be concluded that the runic system was formulated at some point between the beginning of the RIA (c. 50 bc) and the time of the Øvre Stabu inscription. It is clear that the runic characters were inspired in part by Mediterranean writing systems—Roman, Greek, North Italic, or possibly some combination of these—but there has been no firm consensus on this point. Certainly it seems likely that the Roman script was the writing system best known to the Germanic peoples during the period when the runic system was developed.